Division of Soil Science and Conservation offers three area of concentration at the undergraduate and graduate levels, namely: Soil Science & Plant Nutrition (SSPN), Soil Ecology & Biotechnology (SEB) and Land & Water Resources Management (LWRM). This option emphasizes the study of fundamentals in soil science, including soil physics, soil chemistry, soil biology, soil formation and the role of mineral nutrition in the growth and development of crops and quality of agricultural products. This option concerns with soil living organism, their environment and biochemical properties affecting soil biological processes of soil that lead to rehabilitation and improvement of deteriorated and polluted soils. Emphasis is given to soil microbiology and biotechnology in relation to enchanting the availability of plant nutrients and organic substances for sustainable agricultural production. 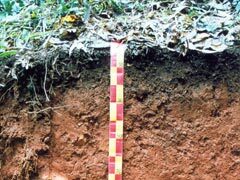 Elimination of toxic substances from soil environment is also one of the main subjects. This option is strongly recommended for students interested in the planning and implementation of soil and water conservation, and information technology, in order to formulate better alternatives for land and water resource management. Related technologies such as modern irrigation technology, soil and water conservation measures, Geographic Information System (GIS) together with Remote Sensing and Modeling will be emphasized to formulate sound land-use decisions for a wide variety of purposes to meet the needs of modern agricultural development and natural resource management.